Originally from the State of Maine, Northeast coast, USA. Part of a very horsey family, I had pursued a horse career single-mindedly all my life. I moved for good to New Zealand in 1995. Bonsai never had a second thought until I was dragged to a series of Bonsai classes in 2002 led by Dianne Miller. Bitten by the bug, the infection is still spreading! My first tree- which I have- was a collected privet, chosen because I wanted a tree to “torture”. My preference is deciduous/leafy trees, and flowering trees. I especially enjoy creating groups and Penjing. 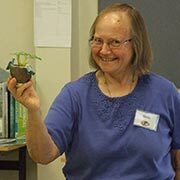 I joined the Hamilton Bonsai Club in 2002 and have been Librarian and on the Committee for several years. I have attended as many Conventions, shows and workshops in NZ and Australia as I have been able and enjoy adding to a growing Bonsai Library. Melody began growing things at an early age encouraged by like minded family members. Wherever she has lived she has continued to expand her cultural knowledge of plants and trees. Her interest in bonsai was sparked by viewing a solitary, aged blue atlas ce-dar for sale at an astronomical price at a garden centre. 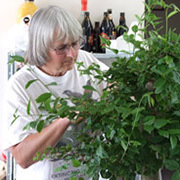 Her busy lifestyle didn’t allow her to explore this further until years later she moved to Tauranga and joined the BOP Bonsai Society, serving a time as President, then with a move to the Waikato she joined the Hamilton Bonsai Club. She is grateful to the people who influenced her early efforts-Shirley Faull, Robert Langholm, Joy Morton and Glenis & Lindsay Bebb. 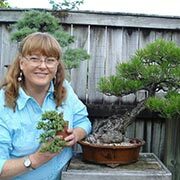 Her bonsai ex-perience has been gained attending courses, practical workshops and con-ventions both in NZ and overseas. Gordon first became interested in small landscapes when quite young, when his older brother* set up elaborate sections of ‘countryside’ on pieces of board, complete with twigs and branches for the trees, for a game [ *he went on to be an Advanced Dungeon Master in a later incarnation.] His thoughts dwelt on the idea of a living version of these landscapes now and then, for a while, though he didn’t know how to go about it. These thoughts then became buried under the more important activities of childhood, and didn’t resurface for a number of years. Gordon became interested in Bonsai as a teenager, having found a book in the local library. In his twenties, he was given a “grow your own” bonsai kit, with Lebanese cedar seeds, which he duly germinated in a tray – and then the cat knocked them down and they all died! Later, his sister gave him a kowhai bonsai [pre-styled], which he had for several years as an indoor plant ( shock, horror!! ); during the intensity of final exams at university, it suffered from neglect, dried, and died. He was very sad. Once he was qualified, he attained gainful employment in Thames. He diligently read all the bonsai books available at Thames public library; and then re-read them. He worked with Dianne Miller’s sister; who told him where to find Dianne and Noel, and one Christmas Eve shortly after they moved to Te Pahu Road, Gordon and his wife turned up to ‘see the trees’, unannounced. Dianne and Noel, being the generous souls they are, said ‘Come in, you’re welcome’, and showed them around. He attended the 2004 Hamilton convention, after a 2 1/2 hour journey on his 50cc moped from Thames, and enjoyed it so much he helped with the tidying up, and immediately after became a member of the club. Back in Thames, he started putting into practice the things he had read about so often. He travels monthly to Hamilton, and has only missed one or two club meetings since joining, where he enjoys the camaraderie, and opportunity to learn more. He attended Dianne’s Bonsai School, where he consolidated the foundations of his bonsai knowledge. He has on occasion put pen to paper, to put into words the information he has accumulated which resonates with his philosophy or understanding of science. He prefers single trees to groups [although he is not set in his views here], and his favourite styles are Windswept and cascade. Favourite trees are junipers and cedars, although he has a fondness for NZ natives, in particular a shohin Kawaka he grew from a cutting. It wasn’t until a Christmas present from my parents in 2014 of a Spruce that sparked my interest again. Since then our collection has grown considerably, and thanks to this great club we have learnt a lot too. I have been the HBC Treasurer since November 2015. In 2017 when Alexis was born I planted several (100’s) of seeds to commemorate her birth, and now it’s something I do every year. Most will know that I specialise in Pines and Maples for the most part, with a preference in trees from Shohin to medium in size. I have been growing Bonsai since 1987 and have been a member of the Hamilton Bonsai Club since 1988 and support the club on the committee. For several years I have been Vice President. I have also been a supporter of the New Zealand Bonsai Association since its beginning. I have studied with Dorothy Koreshoff and hold the Intermediate Certificate, Advanced 1 and H Certificate, and The Bonsai Principals Certificates from the Bonsai Art Academy, Sydney. 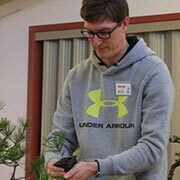 I teach Beginner Classes for the Art of Bonsai in Hamilton. 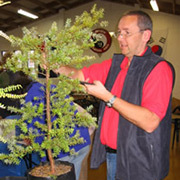 I have demonstrated in both New Zealand and Australia to Bonsai Artists at Club level, NZ Conventions, and to the general public at may shows and events. I enjoy all styles of Bonsai, particularly single tree styles, and I have a collection of Shohin (Miniature) Bonsai down to Thimble Size. 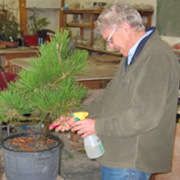 Peter started collecting Bonsai in the UK in the early 90’s. His favourite trees are pines and junipers. 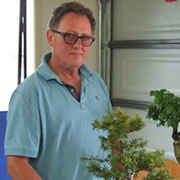 He has created numerous websites for Bonsai Clubs and Associations in both the UK and NZ. Having moved to New Zealand in early 2005 he has had to start again from scratch. In 2009 Peter won the NZBA Emerging Talent Award at the Christchurch Convention and has demonstrated at both local and national level. Les commenced Bonsai in Tauranga about 1990 and has took over as President in Nov 2015. 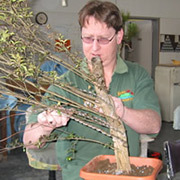 He has previously been the President of the Hamilton Bonsai Club for 6 years. Les has attended various courses with Dorothy Koreshoff, the Bebbs in Brisbane, and Joy Moreton Dunedin. His favourite trees are conifers but is comfortable with all types of trees and most styles.